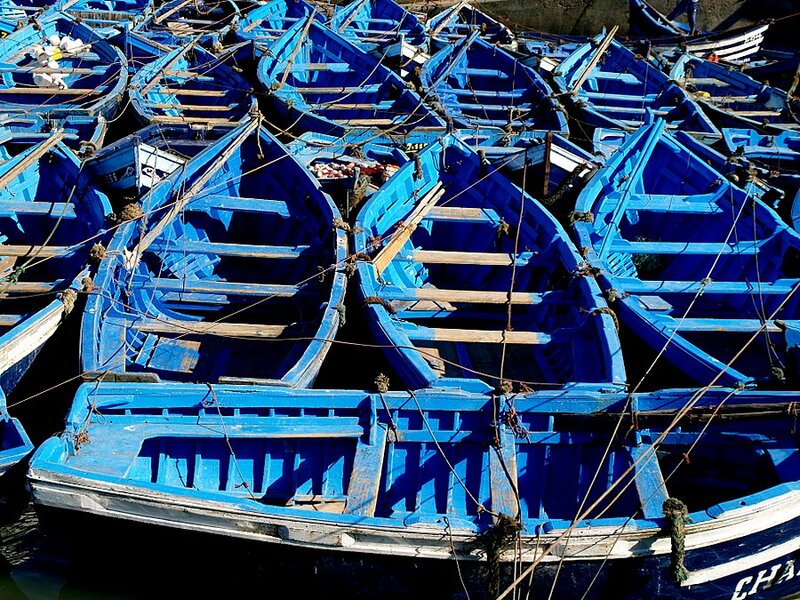 Photo "Blue Boats in Essaouira sea..."
Visitors will start their historical journey at the gateway into the Essaouira port. It was constructed in the year 1793 and the pillars and fa&#231;ade that form part of the gateway are original structures. There are stairs that lead to the top of the wall and the adventurous visitors that do not mind the climb will be rewarded with a spectacular view of the medina, the blue waters of the ocean and the beautiful Crimson islands. After entering the port, attention is immediately drawn to the rows of colorful boats that are made from eucalyptus and teak wood and which decorate the waters of the port. The jovial chatter from fishermen repairing nets and selling fish while trying to discourage hungry gulls is a sight to behold. The docks literally come alive with movement and noise while local fishermen entice passersby to purchase their shellfish, sardines, conger eels and other fresh catches. The Port of Essaouira is not a major fishing port and nearby harbors such as Safi and Agadir have gradually grown larger in that field. However the waters off the coast of Essaouira are still amongst the best fishing areas for sardines. The Port of Essaouira is also one of the most preserved and best examples of a Portuguese port that was left behind to form a part of the area's rich history. The Skala du Port, from where the Portuguese defended the coast, also attracts many visitors - not only for it breathtaking views but also for the cannons that are still guarding their posts. Visitors to this magnificent port will be able to enjoy tasty food at any of the restaurants and stalls in the harbor and be able to purchase a souvenir from the local artists and stands along the port. Hi, my kind friend! Excellent(different) job! A perfect rhythm and colour decision... It is pleasant very much to me. Good luck in all! A beautiful graphic effect you captured, my friend!! Excellent composition, details and colors! Beautiful composition ! Well seen! An expressive and complicated rhytm of the blue...Wonderful idea, Jose! Nice boats! Your works are wonderful, Jose! Especially b&w! Congrats! wonderful graphic effect, the light and the blue tonality are great!